I've heard things in the market news about what's been recently happening as being compared to the Great Depression. Yada, yada, yada. The media must get their information from somewhere, but it isn't with just some simple chart analysis. This was a quick and dirty analysis. I went through 79 years of stock data in about an hr our less, so there might be some minor errors. If the S&P drops to 1015, that will give the value of the S&P lost to about 36%, which would be like in the late 80s. If it were to drop to 50%, then it would go down to about 788. To have the results of the Great Depression, the S&P would need to drop to 210. That would be pretty bad. Could it happen? Sure. Anything could happen. As much as I like a bearish market, things dropping that far would hurt A LOT of people and not be good. We've had 75 yrs of continually exceeding the prior bearish markets. This is the FIRST time that it really didn't do that, so I'm not really sure what that means. What does this say to me? Unless some big miracles happen, it seems maybe we went up way too fast as a market, inflating prices, spending too much, not managing things. Could the Great Depression happen? Really? We have 0% growth from the last cycle. However, if something major happens that is positive, in the past, there have been pullbacks of around 30% to resume the uptrend. This could be similar. I really don't want to see a Great Depression. If it dropped to 1015 and bounced from there to resume the uptrend, that would be nice for every, and a wonderful look at chart patterns. Okay, if the S&P continues to drop, what are the levels that will be important going down? It may not drop to the levels it did in late 2002, early 2003 timeframe. 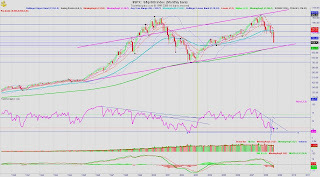 From the graph, the thicker pink line could be where the S&P could turn around on, which would put it around the 1015ish level. This is also where the 200 EMA is. The S&P bounced right off this in the late 2002/early 2003 timeframe. However, the tops of the M are only slightly raised on the right side. So, it may possibly not get as low as last time, which was 768. Where the S&P stopped today, you cannot see it on my monthly chart, but it's on my Daily. 1106 is an area in the past where it failed to rally, and lost that battle to tumble down. That was not an arbitrary number it stopped at today. This month it's had a 197 point range and is the biggest month than any other month. The 1015ish range is not too far from the 1106 of where it is now. It's made some huge moves in the past month. What's another 90 points? It'll be interesting to see what happens. Today I briefly chatted with someone who asked me about RIMM. This is a stock I've traded a lot over the years and have a good understanding of how this stock moves and its options, so at least he picked a good person here to ask questions on. As I chatted with this person, found out he is not real familiar with trading options for stocks, and he just used a blanket statement that he didn't know much about that, rather just options for index funds. He said he wanted to put a small amount of money as his trading platform was giving free trades for the month of October for him. I told him that from my personal experience to test or to learn knowledge using real money right off the bat without doing any practice trading/testing was a very bad idea. He told me his options swing account was very good and that practice trading wasn't the same, as the psychology is different than funded trading. Sure, the psychology is different if you treat your papertrading very different from funded trading. The greater the difference you have between these two also makes a big difference. I'm a big advocator of realtime practice trading. If you're a daytrader, then find a platform that will allow you to realtime practice trade with no delay in data. It can be as easy as is a drop down menu that lets you choose between a funded and a non-funded account, which takes less than a couple seconds. The platform and functions should all be the same. As I've mentioned before, there are 2 differences between my funded and non-funded accounts: 1) quicker fills in real life; 2) trading bar is highlighted in a different color for funded. All functions with regards to my price action/indicators, how I enter and exit trades, trading ladder are all the same for both types of accounts. People usually are more relaxed with their practice accounts, therefore making better trading decisions. What if you didn't know whether you were in a practice or real account? Treat every trade as real whether practice or funded. If we look at Pro Sports players or Olympians, etc., one of the common elements is that they all practice and do their best to simulate real life, as well as work on specific plays to help hone their skills in certain areas. So, if we want to be traders for life, why would people choose to practice their hard earned money away? Good trading entails having a good trading plan & strategy, having good knowledge, executing your trading strategy & plan, managing your risk well. The ideal is to have good trading end in very good profits, but there is always the possibility of a trade going against you. And, thus, you need to have an exit plan to get out that trade. I've made plenty of bad trades where I was highly profitable. These are probably the worst trades as they reinforce bad habits, and in the end, you begin to take riskier and riskier positions. Ultimately, this leads to a person's demise or at least a great dwindling of their account(s), if this is not corrected. You begin to think you're invincible and you begin to develop an ego. A part of good trading is recognizing the emotions you have and managing them, but having very good defined entries & exits no matter what happens in the market or to whatever you are trading. You remain humble, recognizing that most of us are just mere spectators and have no influence whatsoever on the market. A person that is hell bent on using their own money to learn, so let them learn. The Bible says a fool and his money are soon departed. Hey, I've been the fool more than I'd care to remember, but remembering helps keep me humble, knowing I've been there and do not want to go there again. The road to making good trades has not been easy. I spend far more time practice trading than I do funded trading, because in my practice trading, I find subtle things, like sometimes a gambler's mentality lately. There are times I put on much bigger positions and grow my accounts a lot quicker than I would in real life. Hashing out my feelings on things and really being able to identify what is going on emotionally is not always so clear. Even if you had oodles of money to blow, it's still not a good idea to practice firsthanded stuff with real money. If you have that money to waste, please email me. Send me your money and I'd be sure to write you a very nice thank you note. I could add to my accounts to use the money more wisely. I thought this was interesting read. It's fairly clear hopefully who I support and it's for a number of reasons. But, for the purposes of this blog, I'll just stick with how whom is in office will impact the bottom line for my trading. There has to be a way to fund all those socialistic programs and as a capitalist, I am not for a socialistic way of government. Socialist governments are never world powers and I do believe in a strong military, which is not another strong trait of a socialist government. I do not care for our country to be dominated by other countries whom do not believe in the freedoms that we do. I think this country is headed towards a very treacherous rode. Yes, healthcare should be more affordable, but at the same time, people should be more informed about their own health, the foods they eat, take responsibility for their own stuff instead of placing everything on the government. For such an industrialized nation, we have very high rates of cancer and other health problems third world countries do not. Not saying we should be a third world country, because they face other problems, but I do think our country is digging it's own grave, to some extent. Anyway, taxation is a big thing. There may be many things Bush may not have done right, but we have gotten some tax relief during his administration, inspite of what is said about the Iraq war. Right now I'm not making oodles of money in my trading for this to be a huge thing, but I do anticipate in the near future that I will be doing much better and I really don't want all these years of learning, hard work being forcibly made to support things in the government I morally and ethically am opposed to and then see my money squandered. The government, in general, does not want people being empowered in their own health, their own intelligence, and want to keep people stuck, believing their lies. Oh....oops, on the soapbox again. Well, I lost my point. You know who I'm voting for and why, partially. What is and has been happening in our society is very indicative of the lack of personal responsibility and accountability. We continue to condone behaviors like this and now it's in a more public, grander scale. Being responsible is a big thing. How many of us want to admit that we'd really rather have no consequences for our actions and let someone bail us out? Have you ever had a position go against you, you didn't manage your risk and now you're really in the hole and you just hope against hope that maybe some miracle thing will happen, or that you really didn't put on the trade and magically all that money you lost will just reappear? Come on. If you've traded for any length of time, you totally know what I'm talking about. It's our human nature to not want to be responsible and if you're an American citizen, this society does this repeatedly. We are raising generations of people who do not have to be responsible for their actions. Yes, I am getting on the soapbox. I'm in my own challenging circumstances and it would be less challenging if I just allowed myself to be bailed out instead of taking personal responsibility. What has taking personal responsibility meant for me? Wipe up "the spilled milk"
These are just some of the things I've had to do and it hasn't been pretty. However, I've learned so much and am becoming a better person. Situations I never thought I would be in, I am or have been and it's helped me to develop more compassion towards others and how they could've gotten there. As God empowers me to be able to dig out of my mess, it doesn't mean I have less compassion or mercy on others, rather, to be a source of encouragement to help give them hope that they can rise above their circumstances. I've had to eat quite a bit of crow and still doing it, but it's okay. It still doesn't taste good, but it's less shocking. I feel less fear now, though, as I take one step at a time. No one all of a sudden wakes up with an extra 30 lbs, rather it is done 1 ounce at a time, one choice at a time. Life isn't so easy that if we make this one choice it doesn't impact other areas of our lives, so there is this interwoven thing going on. It takes awhile to get out of big messes that are intricately interwoven. As each person who reads my blog, you may or may not be able to impact on a grand scale like some people, but I encourage you to take personal responsibility for all your stuff. When you feel the need to blame someone or something else, think about what you can gain by taking personality responsibility instead. It certainly won't be the easiest or most popular route, but there is something that it does to you as a person when you no longer blame others. It's a great feeling, but it is work. So, with every trade you make, don't say the market did anything to you because the market doesn't know or care who you are. You are just a mere spectator and doesn't even know you. Have a plan to manage your risk and stick to it. When you find yourself not doing it, then begin to analyze why and eliminate those things. It may require a host of things to do this, but be open and aware, then get up and take action. It takes time. I hope people are taking note of the lessons I'm learning in the market, as they are very valuable and will save you time, money and emotions as you trade. Let me share with you some of the things I've learned since last night and continue to learn more than once. Thankfully the things I've learned since last night were in my sim. account. Last night I decided to do more than 1 contract. In fact, I put on 3 contracts, legging in. For those not familiar with "legging in", that means you don't start off with all 3 contracts as an entry. You look for 3 separate entry points to get in. Sort of like good, better, and best entries. This means your first entry may be good, as it LOOKS like the beginning stages of a reversal. Your second entry has greater confirmation of the reversal, and your third entry is a definite area where it has already well into the reversal. Anyway, that's what I did last night. 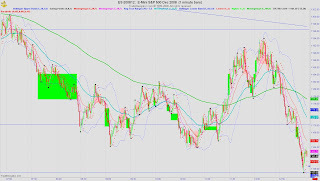 My stops were in place for taking profits and costs. I read my indicators correctly and gave a lot of room for things to move, looking at longer timeframes of 15 & 30 min. to make my decisions, which now I see they were the right decisions. In fact, they usually always are. This morning when I got up, I see my position had turned very much against me, but my stop cost had not been triggered as my criteria hadn't been triggered. Last night I seemed to be making sound judgments, as I had been trading for a number of hours and was in the zen of things, sort of, minus my daughter having upsetting behaviors. Of course, this does impact trading. Well, as I saw things moving quicker against me, though my stop costs not hit, I just flattened all my positions (3 of them) and got out for a -2762.50 plus commissions. I saw ALL this RED and unfortunately, I had my account status up. This is in my virtual account. Needless to say, that's been my single worst cost in futures so far and very upsetting. Did I use any indicators or sound judgment to get out? NOPE. I just looked at how much my position was against me and I flattened. Had I taken an extra minute to do that, I would've seen there was bearish divergence. Anyway, my kids were pills this morning and our household was in super havoc. The kids got to school late, didn't get to eat breakfast, everyone was upset over various things. I needed to get the car washed because I just needed to calm my mind down. The car wash people said I had YET another chip in my windshield and I felt sort of like I wanted to just fly off the handle, but that wouldn't have been good. Plus, the other carwash guy wanted to upsell me on paying $3 more to have my tires cleaned. Well, duh, this is the desert and I have a SUV and kids, they are supposed to be dirty. Yes, it's just $3 more, but I figured, I'll give it to the guy or gal that's wiping down my car for minimum wage, if even that. All I wanted was my car vacuumed out and the outside cleaned. I didn't give a frick whether my leather seats were amour-alled or not as 2 days from now, my car will look like it looked before the wash. Just give me the $4.99 wash and let me be on my way. Normally I'm very courteous and patient, but I just wanted some peace and quiet. My trades were on and I had my stops in place. I carefully assessed what the price chart and my indicators were telling me and though it was just starting to reverse and I had to leave, I decided to just let the positions play out. I had 3 contracts on the table with the stops (profits & costs) in place. On a larger timescale, it said bearish divergence, as well as the smaller timescales, so I just let things do their work. As of this writing, I'm down down -500.00. There were 2 positions I wanted to put down near the target I had of 1137. But, the lowest I went was 1154. The smarter thing was to have one at the 1157, 1148, 1140, but allas, that's okay. I was able to recoup most of the costs this morning and will recoup the rest in the next 1.5 hrs before I need to leave. One of the things I learned in college playing racquetball is always setup for the shot. Racquetball is a fast moving game, but there is always time to setup for the shot correct. You do this by properly positioning your feet, setting your hips correctly, arms/wrist/racquet in place for the shot. You know where you want to place the ball exactly. Granted, as just spectators in the market where very few of us have account sizes that can have any impact to the market, which would probably be all my readers including myself, we cannot say how the game is played. Afterall, we are dancing with the gorilla and you always let the gorilla led, and tell you what it wants to do. But, you can always position yourself to have good entries and exits in trades. As I analyze more of my trades to see what could've been done better, I'm finding that it's not my trading plan or strategies that are in error, rather they are not properly positioning/setting up my plays and not following the trading strategy as I ought to. Yes, you may want to be in a trade right now, but if it doesn't look good and it doesn't meet the criteria of your strategy, stay out. It's really aggravating to see that the majority of my trades that go against me are not due to that, rather it's due to impetuousness. I've been sick since last Thursday and it hasn't been pretty. This wasn't full out blown sick, sick, but it was enough to take me out. Some throat thing, body ache, very low grade fever, headache, nausea, pukiness, congestion and now lots and lots of hacking coughing. Oh, and I've been very tired. In my trading plan, it says don't trade when you're sick, but then I need to define what that really means. One of the things I'm learning is a hacking cough I really need to not daytrade. Why? On some of the fast timeframes I use which requires me to be focused and looking at a number of things very quickly to setup for the trade I want. Today I made 39 simulated trades, and 2 funded trades. Needless to say, I had to stop trading funded because I wasn't doing well with those and hacking away. Today I netted +$50 from 39 trades, which was $155.61 in commissions. My sim account doesn't take that into account, so that's really a -105.61 for today when all is said and done. This is 4.5 hrs of trading. As you can see, this equates to more than $5K worth of money. As you look at the chart, this encompasses most of the trading day, which is 6:30 am to 1:15 pm for me. The first 1/2 hr and hte last 15 min. are not shown as I had no trades in that time period. The areas in shaded green and pink/red are my profitable and costing trades on the 1 min. chart. It's easier to see here than the 15 min. chart where my trades are. There are MANY areas where I had no trades going on. I would say at least 1/2 of the trading day was left untouched by me, which means if I was able to have a magnitude of $5K+, surely a very skilled technical trader probably could've gotten $10K and still left money on the table using 1 contract. From 7-7:30 am, I missed a 12 point drop as I was making lunches and breakfast for my kids. That's $600 if I did not get in/out multiple times. A number of my trades I just wasn't focused. I might have missed putting my fib lines up, or didn't check RSI, or wasn't paying attention to where a temporary support was, or watching volume or MACD, or maybe I looked at a couple indicators, but not all the ones I was supposed to, or panicked, or was looking at my account. Anyway, using one contract, if you're focused you can take $600-1000 or more an hr. I'm not there yet, but I can see the potential. Can you? Do fibs fib? Yes, my poor attempt at humor. I'm not feeling so great today. Puked my breakfast. Didn't get good sleep last night as I woke up at 12:30 am and was up for 3 hrs. Congested, nauseated, body aches, sneezy (and feeling a little dopey not because I took any meds rather just not real clear headed). So, take this blog entry with a grain of salt. I've felt worse before, but since I don't often get sick, I do tend to whine and feel sorry for myself a lot during this time. Inspite of not feeling so well, my virtual trading account is doing okay this morning and on 1 contract, it's made $775 in less than half the trading day. Some of the money was made in the middle of the night and it would've been a bit more, but my computer while I was gone decided to do an update and restarted my computer, which did not allow my virtual position to go through. Anyway, I just wanted to talk a little about fib lines. I haven't been a big fan of this until the past month or so. All those lines and numbers tend to make me a little nuts, but what I've found is the 50% is often a very crucial number. That is the number that seems to even out buyers and sellers, putting things on even keel again. Perhaps I will do a video some time, but for right now, I'm just going to write about it. My Fib tools I use are Fib Support/Resistance where I have settings of 0, 0.382, 0.5, 0.618 and 1. I leave the rest out as it clutters up my screen and I don't find the other numbers very useful. I've often found that as the ES moves up or down, it often retraces back to 50%. Sometimes it will go as far as 61.8%, but that's usually more like tails. 50% seems to be the demarkation. However, just as in a trade I just finished, it only pulled back 0.382 and that was good enough. I don't always know where it will stop, so you have to be cognizant of this. The cool thing is that it DOES stop at those numbers, so don't tell me the market is random because it's not. The key is to be insync with the market, let the gorilla lead and not that it has to do anything you want, you just go with the flow. It seems I am sort of going with the flow of the market right now, but my head hurts and I sort of have an earache, so this will be it for me for today. I'm now at $812.50. That'll probably be it for my real time streaming practice. Today is an emotional day for many, as it's Sep 11th. The other tool I use for Fibs is the Fib Expansion. Instead of a pullback/retracement that is what I use the Fib Sup/Res, this is to determine how far it will continue to go in your favor, possibly. Note that I never know what will happen in the market, rather I can make some determinations based upon its history, what it's currently doing and assess from there. You need to make sure that you have a plan for whatever happens. The settings for my Fib Expan are at 0, 1, 1.618, 2, 2.618. Those seem to work for me. How you would use this is put the 1 at where the high (or low) is, then take the 0 and put it on the low (or high). Okay, was that confusing? If you're in an uptrend, put the 1 at the high and the 0 at the low. Where the 2 ends up is double the move of what it just made. If it's at 1.618, than that is 61.8% above the high. It works similarly in a downtrend. One of the things about trading that I've found is when I feel pressured to make money, that's when I'm prone to the most errors. There are many strategies that can make money and help us to keep money, but most of the time, it's due to operator error in not following the strategy the way it's supposed to. I place myself in this category, too. I know my strategies make money and can consistently do it, but do I? Yesterday I netted a cost and gave back money to the market. I was not feeling well, and felt like I was coming down with something. With lack of sleep and being around sick kids and adults, it was a matter of time before I caught something. Not that I'm all that bad, but even one night of not sleeping well, which is right now, as I woke up in the middle of the night, that can bring one's immune system down. I've been feeling harassed by an individual whom I perceive to be threatening, so that's caused me concern for myself and my children and it's very upsetting. Of course that has an impact on how I trade and it was probably in my best interest to not fund any trades but to continue to practice real time, to better hone my skills. But, such was not the case yesterday. One of the things I'm learning in trading is that I need to constantly be trading well and the difference between funded and not is just a click of a pulldown menu. It's best to be seamless as possible in both practice and real, meaning there should be no difference in the trading. When you can do this, this allows you to be calm, cool and collected in trading. There's been a lot of stuff going on that are negative in my life, and a part of being a good trader that lasts is to be able to handle those things and still trade well. Working on that and cannot say that I've arrived yet, because I haven't. This week, my EMDR therapist did not go over with me doing EMDR. In fact, the last 2 weeks we've not done any and I've had a great deal of resistance to the homework she's given me, for some reason. As I sit here looking at a real time practice trade I did in the middle of the night, which I set my parameters of stops for profits and costs, I can see that if I just allowed the trade to work through, I would've been filled at what I planned rather than getting out too early. You've probably experienced this this -- "Well, this much profits is on the table, I'll take it." to find that if you just left it alone, where you originallyhad your exit point, you could've taken much more off the table. Yup, that's me. Of course, there are those times that you do that, and it comes so close to taking you out, but not close enough and then it completely reverses and then you ask yourself why you didn't take what profits you had on the table. How many of either situations has happened to you? A profit is a profit and you can cash that at the bank. For me, on that trade I exited too early, I did take about 90% of what I intended, which is really good. No coulda, woulda, shoulda. It does no good to our psychie's. What counts is what you actually close with. In my coulda, woulda, shoulda world, I woulda been a gazillionaire by now. I still haven't been bold enough to put on a funded trade in the middle of the night unless I'm sitting here at the computer because just ONE time, I did that and something happened where my stop was way out of the way to let the trade work, I got tagged at my stop cost and that one cost me big. All it takes is one time to really drop your account and being that my futures account isn't all that big, wiping it out with one trade isn't my idea of "live to trade another day". I do look forward to the day when this futures account is big enough to where I can take money from it and not be concerned that it's causing any dent in my account. I also look forward to the days when I can take money out to pay off debts, to help relieve the debt burdens I'm facing after a nasty divorce. It really is about making one quality trade at a time. Quality is the key. Build the account up with one dollar and one trade at a time. Each trade is different. One of the things, though, when I have more than 2-3 costing trades in a row, that means I do need to stop. Sometimes it's just one costing trade that I do need to stop because of the size of it. People do lose sight because they don't realize that it is businesses that give them their jobs. Granted, just as in every system, there are people and companies who abuse the system, then it ruins it for others. Our freedoms are paid for at the cost of the lives of many people. They forget that if you do not show your power and strength periodically, others (other countries) will rise up and see that we're complacent and soon we will be serving them and some of their tyrannical forms of government. I'll share that the hell my kids and I have been through, even so, I have not had to rely on the government for help in any form. God is ultimately my Provider in everything. He has brought individuals to help me in various manner, given me a brain to use, and to take time to dig out of this mess I'm in. Though it has been humbling. God is very good. I would have to admit that I am pleasantly surprised at God's grace and mercy because most people in the horrible situation I was thrust into, I was still able to stay in my house, maintain a good standard of living, albeit, some weeks, months were tight. There are some things that will take awhile to get out of, like fixing my credit, but I have defaulted on nothing, not filed bankruptcy, no child support, taking on all community property debts (at the order of the lame superior court judge), raising 2 young children alone, and still providing my children with all their needs and then some. Sure I would love it if I was making tens of thousands of dollars every day. One day I will be, but for now, I'm rebuilding my accounts one trade at a time with one dollar at a time. I've learned a lot in this process and continue to. God continues to help develop my character and to teach me, giving me many opportunities. The hard times for me have been challenging, but it's caused me to step out of my comfort zone, to live outside my comfort zone and to really trust Him as I step out in faith. Faith isn't something that is spoken about, but it is basically a solid trust put into action something you cannot see. It is not blind faith. There was a point some people said to go apply for food stamps and other things. It was not a matter of pride that I did not, but I honestly felt that God would meet our needs one day at a time and that He would resource me. He totally has. I've not had to go to a food bank to get food (not that there is anything wrong with this) or even apply for assistance at my church. I was able to cut a lot of expenses in our living, renegotiate terms of debts, learn how to better communicate, face my fears, ask people for help in areas I was lacking in, negotiate service prices, be creative in things. The thing was, my kids and I were able to continue to buy the organic products we've always, but all of a sudden (God doing it somehow), things we used went on sale where they did not, or things seemed to stretch a lot further where in the past they did not -- like my gas tank. I'm not sure if I shared in this blog or not, but in the past year, though our electric company has had rate increases, the electric company has sent me letters twice telling me they need to lower my electric bill. My home is always temperaturewise very comfortable. Every time I've had an extra expense, somehow God provided the money to pay for things, or somehow, I would get some super discounts just for no reason. God has been so good to my kids and I, given us favor in our very tough situation. I'm looking back and not even sure how we lived financially on so little, but God IS our Provider. However, it required a heart that recognized it was God and that I was willing to be humble and change. One of the things I've learned and continue to learn is to ASK, which opens the door to leveraging. In situations where they would not normally allow things, I've ASKED and I got, as an exception. It's been awesome. God has given me great favor with a lot of people. A number of people recommended bankruptcy, but I felt that God did not want that route for me, that He wanted to show me that as I submit to His authority that He will make good on everything. Is bankruptcy wrong? I do not believe so, but I think as a Christian even if you have to file bankruptcy, that you are still obligated to pay back all the debts, no matter how long it takes. Legally you do not have to, but I believe God would want us to and He would honor that. It can be a great challenge to keep focused on the Lord and not go into some self-pity party (which I have often), but I keep being reminded who I am in Jesus Christ. He is my Savior and whether I make money today or not, it's really inconsequential in the grand scheme of things. God knows my needs, I've asked Him, and I just need to daily submit all of me and He'll make things happen. I continue to thank God for setting before my path to allow me to trade. It is such a privilege that despite being in not a great financial situation, that I do have money to trade with, that I am making money, that I get to live the life I want to be the mommy I want, and the greatest thing is, that I get to serve my Lord and Savior Jesus Christ, that He calls me worthy. God is so good. I am humbled. I am grateful. I get to work from my home, own my own time (actually, it's all God's, but He allows me to manage it)!!! I've gone off on so many tangents, but I just wanted to share some of my heart in what it means for me to be able to trade, to be able to be here for my children, to have freedom with my time. I believe also a part of all that I've gone through is to help and encourage others in their journey, no matter how challenging it may be. And, to also use wisdom in what I'm doing, to be creative and resourceful. Our God is such a creative God. Even if the guy that becomes President that I do not want, I believe it will just mean more opportunities for me to be creative to learn how to be more resourceful legally. One of the things of businesses is that they are taxed AFTER expenses. Maybe I'll just have to find more legal expenese. However, I believe too much government intervention in our lives lead to countries like China and other tyrannical forms of government. This is a very important issue for me when I vote. As a business owner for my trading, this does impact what I get to keep. Also, taxes for every trader, investor, anyone who has any retirement, this should be of concern to you. Think carefully about who you want to vote for. I personally think that when I make over $250K/yr why should I be penalized for all the hard work it took to get there? Businesses stimulate the economy by employing people. Put more burdens on business owners? Note, this is a very quick analysis of RIMM. There is a lot to see with this chart but do not have time to post a video of a complete analysis. I'm only sharing what I see and by no means making any recommendation to trade or not trade RIMM. Do so at your own risk.